Cotton On is a global game-changer when it comes to clothing, stationery and shoes. Get your hands on the latest women’s, men’s, kid’s, teen and baby fashion. Step into the hottest footwear. Find your favourite underwear, swimwear and sleepwear. Treat a friend (or yourself) to gifts, stationery and personalised products. 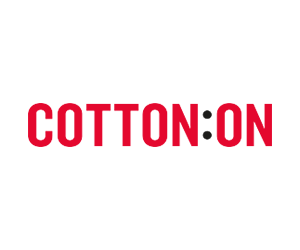 Cotton On helps you save money with: Exclusive online offers; Unidays Student Discounts; $10 when you join Cotton On Perks. Some retailers have their own policies and restrictions. Before shopping, please ensure you review the Special Terms of Cotton On (above) for further information. Complete your purchase in one session and without leaving Cotton On. Do not click on any bookmarks or advertising banners or links once you leave ANZ Bonus Points Mall. Free Standard Shipping to Australia on orders over AU$55. Standard delivery is 3 to 5 working days. Next business day delivery to roadside addresses and offshore islands within these zones is not guaranteed. You will need to sign for your order when it arrives. If you are not available to sign for your order, Australia Post will leave a note with instructions for pick up from a designated post office. If something isn’t right, or you change your mind, we are happy to accept a return within 30 days of purchase. Item(s) must be unworn, unwashed, or otherwise unused with all original tags/labels attached. Swimwear, underwear, earrings and cosmetics cannot be returned or exchanged. Giftcards, sale, clearance and seconds items are not eligible for a refund or exchange.